So recently I have come to the point that I must debate the Great Cataclysm, The Sundering of the World, The Descent into the Long Night, the blah, blah, blah, blech! This is not a particularly relishing topic as I am not the most innovative person. I can draw from a well of other person’s work and spin an originally memorizing tale of folly and deceit, or so I am told. But I lack the oh so crucial spark to start the process. Sometimes I get lucky, but more often I draw from other sources. I believe I have come up with an original idea for a post apocalyptic game, at least I am unaware of another using the same concept. Unfortunately, I am not willing to let the cat out of the bag just yet. I picked up my copy of D20 Modern Apocalypse, and realized that my setting has many of the aspects of the cataclysmic events from which the sources lists. Alien Invasion – Aliens invade and become trapped in a mutual self destruction. My game has a specie of questionable origin and some suspect of alien origin; I confirm nor deny anything at this juncture. Biological Disaster – Yes, I tap into pandemic virus craze that crops up in hollywood every few years. I am even toying with the zombie virus concept, mainly because zombies are awesome. I of course have my own twist on the concept. Environmental Cataclysm – This an event where nature changes and makes it impossible for humans to survive as is. Think polar caps melting and creating “Waterworld”; mother nature tries to correct the pollution man creates and the world super freezes like “The Day After Tomorrow”, or the center of the earth stops spinning, jacking with the weather of the world in “The Core”. While my game does have environmental change, it happens along side of the apocalypse, possibly exacerbating the process, but not causing it. Asteroid Strike – “Armageddon”, “Deep Impact”, “Meteor Apocalypse”, “Rage”, hopefully you get the picture. Big rock hits the earth, makes life hard. This one isn’t in my game, but it makes for a good story as to why humans create facilities to prepare for the apocalypse. Judgement Day – Not “Terminator” style Judgement Day, but in a biblical sense. A hundred million Mephistopheles erupt from the bowels of the world and do battle with the ascended and we poor souls left in the ravaged wake eek out survival. I find it ironic that I have no interest in creating an apocalyptic biblical setting, but I am not adverse to an apocalyptic Ragnarok setting which are both theological. Nuclear Armageddon - I find it hard to relate the post apocalyptic genre without Nuclear events. 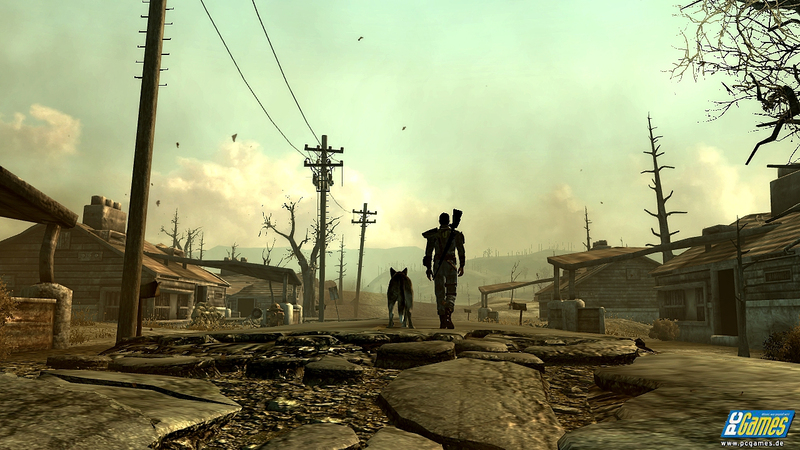 I find the gas-mask, radiation, wasteland looking environment to be a staple of a good post-apocalyptic piece. I believe Fallout is such a huge success because it brings that “Apoclyptia” to us in such a genuine format. Rise of the Machines – “The Matix”, “Terminator”, “I, Robot”; these movies help define the human vs robot apocalyptic future. While I like these movies and their concept, I do not use them in my setting. Rogue Planet – I found this scenario to be the most interesting, at first I found it to be a wonderfully original idea to me, but then I remembered one of my favorite childhood cartoons and this can be paralleled to “Thundarr the Barbarian”. I like the idea, but feel it does not fit with what I am going for. Supernatural Invasion – I find this along the lines of the Judgement Day scenario, but does not have to be religious in nature. I prefer to have my Apocalyptia rooted in science more than fantasy/horror though. Well there you have it, D20′s reasons behind an apocalyptic future. My questions to you is, which one (or ones) do you find interesting for a setting? Will it effect my overall choice in the reasoning of my game? Perhaps, since the game is designed with others in mind, I like to hear other’s opinion on the topic.